Simple batch convert with .bat file. Re: Simple batch convert with .bat file. This version continues after an error occurs instead of aborting. It keeps a list of the files which generated processing errors and so were not converted. Since you could be processing hundreds of files, the err msgs may otherwise scroll off the screen. echo Converting "%%~fF" to "%%~dpFconverted\%%~nF.mp4"
ffmpeg.exe -i "%%~fF" -c:v copy -c:a aac -y -hide_banner -loglevel error -map_metadata 0 "%%~dpFconverted\%%~nF.mp4"
rem Next line sets the MP4's file date/time to the same as the original MP4 file. if exist "%%~dpFconverted\%%~nF.mp4" touch -r "%%~fF" "%%~dpFconverted\%%~nF.mp4"
rem Next line shows the MP4 after it has been created, so with multiple MP4s it acts as a sort of progress indicator. rem if exist "%%~dpFconverted\%%~nF.mp4" dir "%%~dpFconverted\%%~nF.mp4" | find "/"
I found using -i "%%F" problematic with files with inverted commas around them. The most consistent results seem to be from using -i "%%~fF". start /i conversion_error.txt runs the associated program for text files, typically Notepad, and loads the file. Will give it a go tonight. Thanks. What is encoding format of the audio stream in the .m2ts files (same as .mts) used for BD? The Mediainfo program (https://mediaarea.net/en/MediaInfo) will tell you. I'm pretty certain it's H264. I can use MultiAVCHD to create output from mp4's, but it should be quicker to use m2ts files for BD output and save MultiAVCHD much of the work (That's my thinking). From memory, for DVD, the video stream is mpeg-2 (M2V) and the audio stream is either pcm16le (.wav) or mp2, so both steams will need to be converted when converting from MP4 to M2TS/MTS. Yes DVD is mpeg 2 but I intend creating HD compatible DVDR's (to play in Blu-ray players and HD compatible DVD players) which I believe are the same m2ts as BD output? Standard DVD format is very low resolution compared to HD (about a quarter I believe) although I've produced surprisingly reasonable results with DVDStyler. What is encoding format of the audio stream in the .m2ts files (same as .mts) used for BD? I'm pretty certain it's H264. Sank, H.264 is a video codec, but I was asking about the audio stream. So what audio codec is expected for the audio stream in the .m2ts containers destined for BD? Firstly, I jumped ahead of myself after reading "What is encoding format" and missed "audio stream" . Should have said AC3. However, my earlier post was also not as clear as it could have been regarding the DVD output also being HD, which is m2ts-h264-ac3, for playback on compatible players. The spaces are not an issue. It always processed one file, regardless of its naming structure. This example (v2.bat) failed to run, creating an error due to not recognising the file path. See below. I haven’t seen any indication (in the cmd window) of an error occuring with the first version. Just the failure to encode more than one file. However, there may well have been an error as this version (Convert_MTS_to_MP4_v3.bat) works perfectly in XP, converting all the files from m2ts-ac3 to mp4-aac (mediainfo confirmed), with no errors reported. See below. So it appears you have solved it as far as XP is concerned. I suspect the first version will run just fine in Win 7. This version as well probably. I don’t generally use inverted commas for file names. Don’t know if this helped solve the issue. More likely something to do with error reporting perhaps ? This has been a very useful learning experience. Your help is greatly appreciated. Can’t say I understand the cmd code as it’s less descriptive than some of the simpler coding languages I’ve dabbled with in the past, but I intend delving a bit deeper so I can maybe make some adjustments if required in the future. Where did you source the cmd script info to get you this far ? Where did you source the cmd script info to get you this far ? I don’t generally use inverted commas for file names. Don’t know if this helped solve the issue. 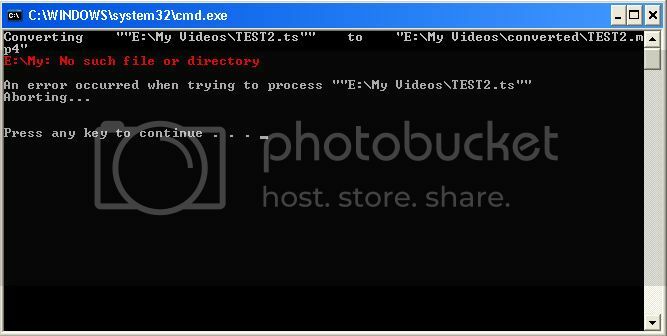 if exist "%%~dpFconverted\%%~nF.mp4" dir "%%~dpFconverted\%%~nF.mp4" | find "/"
Converting "C:\Filename_test\Directory A\test 1.MTS" to "C:\Filename_test\Directory A\converted\test 1.mp4"
Converting "C:\Filename_test\Directory A\test2.MTS" to "C:\Filename_test\Directory A\converted\test2.mp4"
Will take a look at both, thanks. Interestingly DVDStyler fails to encode if it's installed in "Program Files" because of the space in the path name. It has to be installed in C:, or Windows. DVDStyler calls an ffmpeg.bat to encode. Something to do with double quotes not being used on the called path name causing issues. Yes, I noticed that. I thought I had done it whilst disabling/enabling touch to check it functioned correctly. When touch is enabled the Modified date in Properties remains the same as the original, when remarked out, the current date displays in Modified. In both cases the Created date is the current date. This is fine, but wasn't sure if that's how it was intended? When touch is enabled the Modified date in Properties remains the same as the original, when remarked out, the current date displays in Modified. In both cases the Created date in the current date. This is fine, but wasn't sure if that's how it was intended? There's an amount of flexibility with both TOUCH & DIR. The reason I added TOUCH to the batchfile was, when converting my camcorder files from AVCHD to MP4, I wanted the file dates to stay the same, as it gives me an external indication of when the video was shot. Changes files access, modification and creation times. -a, --access-time Change file access time. -c, --no-create Do not create any new files. -m, --modif-time Change file modification time. -p, --pause-exit Pause on exit. -v, --verbose Output the result of every file processed. -x, --creation-time Change file creation time. -r, --reference REFFILE Use this file's times instead of current time. -t, --time TIME Use [[CC]YY]MMDDhhmm[.ss] instead of current time. You could probably place it elsewhere as long as the pathname has no space in it e.g. C:\Video_Utils\DVDStyler. As well as spaces, you should test for directory or file names containing an inverted coma e.g. Dan's_Holiday_Video.mts and Dan's Holiday Video.mts. Will bare that in mind. Will save this for future reference. As long as I have an indicator of the original time, regardless of what it falls under, I'm happy for now.